Early this morning — just after 3:30 — I heard a knock on the door. My father, breathless after walking up two flights of stairs with his bags (he got in the elevator that only goes to the 4th floor… I live on the sixth), had enlisted the aid of a Mcdonald’s delivery boy who had just dropped off some McFood to another tenant in the building, to help him get to my door. I arranged for a driver to meet him at the airport and bring him directly here. I hoped Dad would take my advice and have the driver phone me in advance so I could meet them at the door, but he didn’t, so they caught me by surprise. I was so glad to see he had made it safely. Dad came inside and nearly collapsed in the chair, exhausted after more than 24 hours of travel. I gave him a beer and we chatted for a while — he told me how he had taken the train to central Amsterdam on his layover there. After a half an hour or so, we went to bed. As I write this, he’s still sleeping — nine hours and counting. Before you think I’m a bad son for not going to the airport to meet my septuagenarian father in person, you should know that I organized a meet and greet service to help him through immigration and customs. He was well taken care of. But I neglected to tell the person who was making the arrangements my dad’s name. Assuming my middle name was his first, she arranged for Weldon Duff to be met… not Willard. So dad was a little startled to see that name on a sign when he entered the airport hall (Weldon was my mom’s father’s name, but everyone called him Si — pronounced like sigh or Cy). In Arabic, men often take the name of Abu (which means father) and that of the first born son. So, “Abu Craig” will spend the next ten days or so here with his ibn (son). And I’ll post stories and photos as the father and son take in more of the sights of Egypt. We’ll hit the usual places in Cairo and make it down to the magnificent ruins of Abu Simbel, which were disassembled and saved from the floodwaters rising behind the Aswan High Dam in a marvel of engineering and archeological gumption. 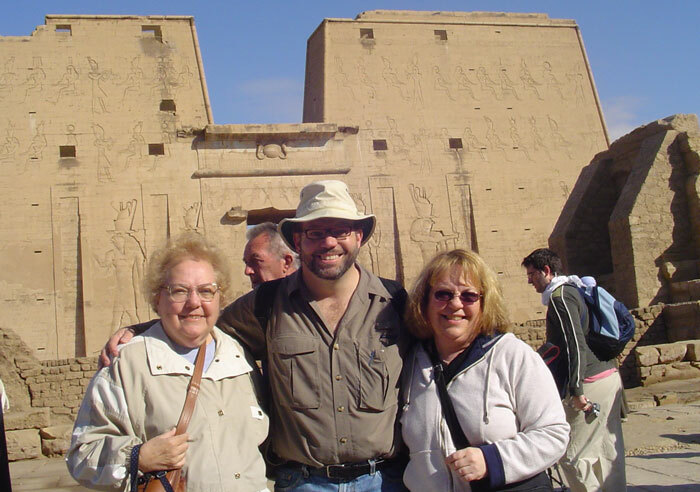 Here’s a photo of mom, me and sis at the temple at Edfu.